At cash4coins we operate a unique bureau de change style service, we will buy your foreign coins – something that UK banks and other bureau de change companies won’t do. We all know that many of us have a collection of foreign coins lying around that never get exchanged back into Sterling. Our Bureau de Change style service means that you can now exchange those unwanted foreign coins back into a currency of your choice. You may want to organise a coin collection between friends or work colleagues, maybe you’d like to collect foreign coins as a fundraising idea for charity. Whatever you decide you can use our cash4coins bureau de change style service to exchange your foreign coins. We offer the service that the banks won’t and we can convert your coins into cash you can use before you know it. Our service is super fast, easy and simple to use. You send us your foreign coins and notes (see how to do this on our page: How to send us coins ) or if you have over 3KGs of coins then we’ll collect for FREE using our secure courier service. It really couldn’t be easier and our friendly team is standing by right now to assist you if you need help. You can also read lots of advice in our FAQ section. Once your currency is received we count and sort it and then make you an offer to buy. If you accept we’ll make payment directly to your bank (or via PayPal or Cheque). In the event that you don’t accept our offer then we will return your coins and notes FREE of charge – this is our 100% satisfaction guarantee. 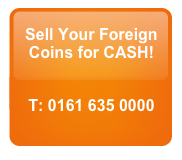 We accept all foreign coins, and you don’t even have to sort them! We inspect each and every coin to assess the value. We even take old British and Irish coins as well as pre-decimal coins. That’s right, if you have old 50p, 10p or 5p coins lurking around, you can simply collect them all to us to sort and count for you. Remember, you don’t have to accept our offer, but if you do, we could deposit your cash into your bank or PayPal account very quickly for you. That’s money that is hanging around doing nothing suddenly converted into cash you can spend! If you’d like to see what other people are saying that have used us then please take a look at our customers comments page, we’re sure you’ll agree that our customer care is second to none. This is what differentiates Cash4Coins. If you’d like to use our foreign coin bureau de change style service then please contact us – we’d love to hear from you. Our service is fast, friendly and easy to understand and we have helped countless customers to make use out of their leftover currency or old currency. Send us your coins today and you could be enjoying a little (or a lot of) extra money in your bank account to spend as you wish.